Berkeley is an interesting place. When I was a graduate student there, I recall a trip to get a burrito at the now-defunct Poncho’s restaurant plus CDs at the still-thriving Amoeba Records in which I rode down the elevator of the physics building with Charles Townes, the Nobel-prize winning inventor of the laser, and then encountered several people on Telegraph Avenue who were going about their business naked, in solidarity with The Naked Guy. I still remember thinking that it was a shame that the people who walked around the streets naked weren’t necessarily the people that you actually wanted to see naked, but I digress. One day, I remember hearing that another physics graduate student at Berkeley was giving away a piano for free to anyone who would remove it from the student’s apartment. A friend of mine wanted his kids to learn piano, so we went to check it out. The piano’s owner told us that it had at one point been played by Rachmaninoff, which sounded pretty impressive to us. We arranged for a piano mover to get the piano. The mover, a short Chinese opera fanatic, did virtually all of the heavy lifting to get the piano down the stairs of the apartment building. Our job was just to keep it balanced. I was on the upstairs side of the piano at my wife’s request – she told me that I was worth more to her alive than dead. Well, it turns out that Rachmaninoff wasn’t the only prominent musician to have played the piano. The owner that was giving it away for free was Vijay Iyer. At the time, he was known to me as a “good piano player,” but I hadn’t heard him play apart from a few quick phrases when he first showed my friend the piano. 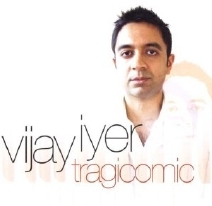 But now, Vijay is recognized as one of the top jazz pianists of his generation. In fact, he was just named a 2013 MacArthur Fellow. Check out the announcement here.